The Club is a proprietary club. The Company will provide the Club with the Golf Course and Clubhouse together with ancillary facilities and everything reasonably necessary for the carrying on of the business of the Club in accordance with its objects and these Rules. The Company will be responsible for all expenses relating to the Club operations, the engagement and administration of the Management Agreement and all other matters including the expenditure of money. The objectives of the Club are to establish, maintain and conduct a golf club, to encourage social activities between the Members, and generally to afford to its Members all the usual privileges and advantages of a proprietary golf club. In order to carry out its objectives the Company will provide the Club with the Facilities. There are thirteen categories of Membership; Founder, Life, Full, Associate, Corporate, Student, Junior, Overseas, Temporary, Social, International Country and Day. Membership will be at the sole discretion of the Company. Its decision will be final and no reason for refusing any Membership application will be given by the Company. In all categories, with the exception of Temporary and Social, the right to Membership is only accessible by being nominated by a Debenture Holder or the Company. Before being accepted as a Member, the individual will be required to agree to abide by the Rules, including the payment of Joining Fees and Annual Subscriptions as referred to in Rule 6. A Member will remain obliged to abide by these Rules until such time as he or she resigns or his or her Membership is terminated or suspended pursuant to Rule 8 or, in the case of a Full or Associate Member, until such time as his or her nomination is withdrawn by the relevant Debenture Holder. special privileges attached to Founder Membership. A limited number of Full Debenture Holders were invited by the Company to pay a single non-refundable sum at the prevailing rate plus any applicable VAT, and become entitled to nominate a Life Member. subject to payment of a Joining Fee and Annual Subscription at the prevailing rate plus any applicable VAT. Full Members will be entitled to use the Facilities of the Club at all times subject to Rule 24. Each Associate Debenture Holder will be entitled to nominate a Debenture Nominated Member for Associate Membership of the Club subject to payment of a Joining Fee and Annual Subscription at the prevailing rate plus any applicable VAT. Associate Members will be entitled to use the Facilities of the Clubhouse at all times but only to play on the Course on weekdays other than Bank Holidays and subject to Rule 24. A limited number of corporate bodies may be allocated a number of Full Debentures and Associate Debentures. The minimum allocation is four Associate Debentures allowing up to 12 Alternate Members to be nominated and is subject to the payment of the Corporate Membership Joining Fee and Annual Subscription at the prevailing rate plus any applicable VAT. Corporate Members may arrange an annual golf day as determined in the schedule for Corporate Membership subject to the prior consent of the Company. Membership Year. Arrangements whereby Student Members may use the facilities of the Club will be displayed in the club diary. The Company will be entitled to accept a Junior Member subject to the payment of an Annual Subscription at the prevailing rate plus any applicable VAT. Junior Members must be 17 or under at the commencement of the Membership Year. Arrangements whereby Junior Members may use the Facilities of the Club will be displayed in the Club Diary. The Company will make available a limited number of Overseas Memberships. To apply for this category of membership the applicant will be resident outside the United Kingdom for a period of not less than six months each year. A reduced Annual Subscription will be payable and subject to VAT. The Company reserves the right to nominate Temporary Members against Debentures that are not subscribed for. Life, Founder, Full, Associate and Overseas Members will be entitled to nominate one additional individual as a Social Member, usually their spouse, partner or child over the age of 18, without payment of any fees. Social Memberships will be renewable annually. Social Members will be entitled to use the Clubhouse at all times subject to Rule 24, but will not be entitled to make use of the Course or any other facilities that may be provided from time to time. The Company is entitled to nominate International Members against Debentures that are not subscribed for. Only non-UK residents may apply and proof of residency will be required. International Members will be accepted on receipt of the Joining Fee and Annual Subscription, as set out by the Board. International Members are not entitled to vote. International Members may play golf seven days per week, but will be restricted to play after 10 am at weekends and UK Bank Holidays. International Members have the right to bring up to three playing guests mid-week and one playing guest at weekends, on payment of the relevant Green Fee. Debenture Holders who reside outside a 75 mile radius of the Club may apply for Country Membership. Only 25 Country Memberships will be available at any one time and Annual Subscriptions will be set annually by the Board. The Management will, at its discretion, allow a limited number of Day Members (averaging no more than 50 per year) to play the course at off peak times (Monday-Thursday). These Day Members will, for a fee, be allowed to play 18 holes of golf and to use the Clubhouse and practice facilities but will not be entitled to enter Club competitions and events. Day Members will be fully briefed on the Rules of the Club and expected standards of etiquette in advance of their visit. Day Members and Day Member tee times will be carefully managed to avoid any disruption to the Members of Bearwood Lakes Golf Club. The Company will be entitled to accept an Intermediate Member subject to the payment of an Annual Subscription at the prevailing rate plus any applicable VAT. Intermediate Members must be between the ages of 21 to 27 inclusive, at the commencement of the Membership Year. Arrangements whereby Intermediate Members may use the Facilities of the Club will be displayed in the Club Diary. Every Member shall submit to and be bound by the Rules and any byelaws from time to time in force. Every Member shall communicate their address or that of their bankers or agent from time to time to the Company and all notices or letters sent to such address shall be deemed to be duly delivered. decided by the Board and announced annually on or before 1st March in each year. Annual Subscriptions are payable by 31st March annually in advance by all Members. Part payments of the Annual Subscription for Members who join during the year will be accepted on a pro rata basis at the discretion of the Company. Refunds for Members who leave for any reason during the year will not be given, other than at the discretion of the Company. with a Debenture Nominated Member, save where the Debenture Nominated member has been expelled as a Member. such period as its thinks fit or expulsion from the Club in respect of such Member. No Member or Debenture Holder will have the right to compensation by reason of any action so taken. Should a Member who is also a Debenture Holder be expelled from the Club their Debenture may be forfeited. candidates only, and each Member will be entitled to vote for one candidate for each office by a postal vote. In the event that there are insufficient candidates nominated, the Membership Liaison Group may fill the remaining vacancies. If two or more candidates obtain an equal number of votes, the Membership Liaison Group will select from such candidates the candidate who is to serve as the relevant officer. The Membership Liaison Group will appoint the Ladies Handicap Secretary and other ladies required to form a ladies committee required under LGU rules. Members of the Club. Members may only approach the Company through the Membership Liaison Group. The Membership Liaison Group may make proposals to the Company on behalf of the Members. The Membership Liaison Group will comprise the President or his or her nominated representative, the Captain, Vice-Captain, Lady Captain and Lady Vice Captain. Life, Founder, Full and Associate Members will be entitled to attend each Annual General Meeting of the Club, which shall be held in February of each membership Year. They will be entitled to nominate candidates, propose and second items for consideration, and vote on proposals. The Captain and Lady Captain will each year resign and be replaced by the relevant Vice Captain. The Captain and Lady Captain will not be eligible for re-appointment as Vice Captains for a periodof five years. The Chairman of the Company will act as President of the Club. In addition to the above the Membership Liaison Group may propose to the Company candidates for election as Honorary Vice President for such periods as they think fit. Any Honorary Vice President may use the Course and Clubhouse and will have all the rights and privileges of a Member. The Membership Liaison Group is the means of formal communication by the Members of the Club to the Company. Office. The Company will give all reasonable consideration to such representations but any decision taken by the Company will be final and binding on the Members. Liaison Group meeting. The President or his or her nominated representative will be the Chairman of the Membership Liaison Group. Decisions of the Membership Liaison Group will be made by a simple majority or those present and voting. If there is an equality of votes the Chairman will have a casting vote. A meeting of the Membership Liaison Group may be arranged at any time if required to do so by three Members of the Membership Liaison Group. Subject to these Rules, the Membership Liaison Group will regulate their own procedure. All matters concerning the interests of the Members will be coordinated by the Membership Liaison Group and communicated to the Company at the Membership Office in the Clubhouse. Debenture Holders will regulate their affairs in accordance with the Debenture Deed. The Company may from time to time require the Membership Liaison Group to perform such additional functions that the Company may delegate to it. The Membership Liaison Group may, with the written permission of the Company, appoint task groups selected from Members willing to join the same for such purposes and with such powers as are approved by the Company. Each task group will appoint its own officers to perform such specific duties as are approved by the Company. and Members. They will keep minutes of all proceedings and records of the Membership Liaison Group, task groups, including all handicaps, competitors, events, and Members’ Annual Subscription and expenditure accounts. The Annual General Meeting of the Club will be held in February each year. The venue of the Annual General Meeting will be the Clubhouse or such other venue as may be determined by the Company. All Life, Founder, Full and Associate Members of the Club will (unless suspended) be entitled to attend and vote by the show of hands at the Annual General Meeting. Corporate Members will have one vote per Debenture purchased. The Chairman, or his or her nominated representative, will chair the Annual General Meeting. Members when any questions of urgent importance arise and the Company will be bound to do so upon receiving a requisition at the Membership Office signed by not less than 50 Members for a date no later than 21 days after the date of requisition. place and hour of the Meeting, will be sent to every Life, Founder, Full, Corporate and Associate Member by letter to his or her address as given in the Club register and will be affixed on the notice board in the Clubhouse. No business shall be transacted at a Meeting unless a quorum is present. Four Members of any category shall be a quorum. quorum ceases to be present, the meeting shall stand adjourned to the same day in the next week at the same time and place. A resolution put to the vote of a Meeting shall be decided in the first instance on a show of hands. A poll may be requested by the Chairman or by three or more Members. On a show of hands, all Members entitled to attend and vote shall have one vote. 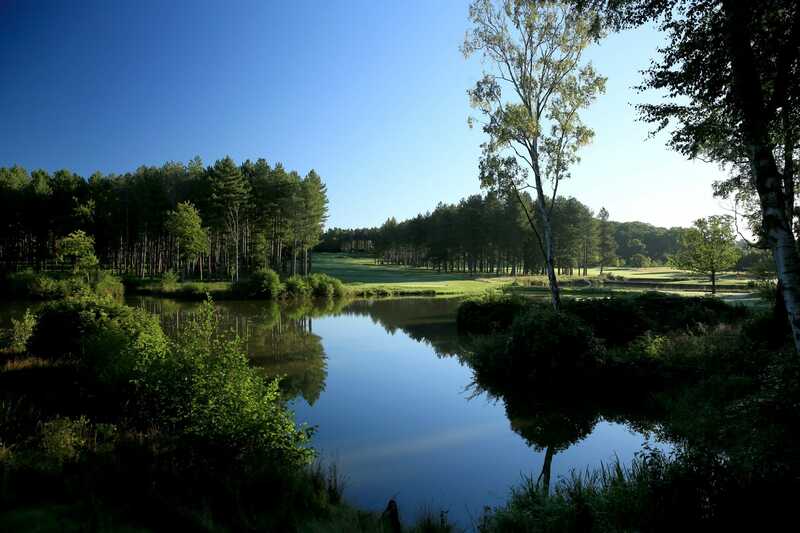 • Founder and Full Members may introduce not more than three playing guests on any day. • An Associate Member may introduce not more than three playing guests on weekdays. • Day Members are not entitled to introduce guests to the Club. only play six times per annum on weekends as a Member’s guest and not on days of Club competitions. • A Member shall accompany his or her playing guest unless otherwise permitted by the Membership Staff. • The playing guest’s name and address and the name of the Member shall be entered in the visitor’s book. Members may, however introduce small groups of guests or arrange corporate golfing days on occasions when this will not cause inconvenience to the Members. • The Company will allow the pupils of Bearwood College and the golf teaching staff limited access to play the Course at restricted times as guests. These times will be posted on the notice board. • The Company reserves the right at its absolute discretion not to accept the introduction of guests at any time. A Member or Social Member may introduce non-playing guests to the Clubhouse and its facilities (excluding the Course). The non-playing guests shall be accompanied by the introducing Member and his or her name be entered in the visitor book. The number of non-playing guests that may be introduced will be restricted as deemed necessary by the Company. Liaison Group and will be given all reasonable consideration by the Company. The Company may in its discretion close the Clubhouse or Course or any part thereof for any period which it may consider necessary or desirable, in order to affect maintenance, redecoration or refurbishment and for up to five days per year for tournaments and Pro-Ams. The Company will always try to give reasonable notice of its intentions to effect any such closure and the case of tournaments and Pro-Ams all Members will be offered a free spectator ticket. No Member will be entitled to a refund of Annual Subscriptions or Joining Fees or any other compensation by reason of any closure of the Course or Clubhouse. On occasions when the Clubhouse is being used for a function, either for a Club event or by a Member or visitor, certain areas of the Clubhouse may be closed to Members. From time to time the Company may impose changes to these rules to promote the efficient and smooth running of the Club. Major changes will only come into force after a majority vote ratifying the same at an Annual or Extraordinary General Meeting. Players will at all times abide by the regulations and rules of the game of golf adopted from time to time by the Royal and Ancient Golf Club of St. Andrews, the County Union, the EGU, the LGU and the Standard Scratch Score and Handicapping Scheme 1983, together with such local rules as the Company from time to time considers appropriate. Members and their guests will be required to dress appropriately in the Clubhouse and on the Course at all times, although gentlemen will not be required to wear jackets and ties in the Clubhouse except on specified occasions when advance notice will be given. A Member will not be liable or responsible for any of the liabilities of the Company or the Club by reason solely of Membership save for payment of a Joining Fee where applicable on first becoming a Member and payment of Annual Subscriptions in accordance with these Rules. competition, or any other activity operated, arranged, organised or sponsored by the Club will do so at his or her own risk and will hold the Club, the Company and its Directors, officers, employees, representatives and agents harmless from any loss, costs, injury, damage or any other liability sustained and/or resulting from any act or omission of any Member or guest introduced into the Club or any visitor. The Club, the Company and the Directors, officers, representatives, employees and agents thereof will not be responsible or liable to any Member or his or her guest or any visitor for any articles brought onto the Club premises. from time to time. Restrictions will be posted on the notice board as the occasion arises. Members of the medical profession may, with the permission of the Membership Staff carry bleepers on the Course. The Club may not be used for betting, gambling or any unlawful games in contravention of the Gaming Acts. card will allow Members to settle the balance of their account monthly by Direct Debit. an acceptable credit card and signing the appropriate credit card voucher, or a cash deposit before any expenditure is incurred. The Club reserves the right to levy Members to ensure an adequate food and beverage revenue for the Clubhouse. There is a Club levy chargeable in advance at the beginning of each golf year commencing 1st April. Terms and Conditions can be found in the club diary. produced on request. Bag tags must be displayed and be visible on golf bags. Guests and visitors will be issued with temporary tag as valid only for their visit and should also be displayed and be visible on golf bags. The sharing of golf bags and equipment is not permitted. Pets will not be permitted within the Clubhouse or on the Course. The Pro Shop has the sole rights to sell sports equipment and clothing and accessories on the Club premises. tee position for each hole and each Member must play from this position. Competitions, whether Club or external, shall be held at such times and under such conditions as the Company shall determine after liaison with the relevant committee. The Course may be closed to all but competitors on such occasions as the Company may from time to time decide. No Member shall take away, or be permitted to take away, from the Club premises under any pretext whatever, or shall injure or destroy, any article that is the property of the Club. No paper, notice or placard, written or printed, shall be put up in the Club without the sanction of the Company. All Members shall pay every expense they incur in the Clubhouse or upon the Club premises before they leave or as otherwise agreed by the Company. The Clubhouse shall not be used for any unlawful purpose. The hours of the sale of intoxicating liquors will be fixed by byelaws made by the Company from time to time in conformity with the appropriate laws and regulations in force at that time. which requires to be served upon the Company, may be served by sending it through the post in a pre-paid envelope addressed to the Company at the registered office of the Company from time to time. Any communication served by post shall deemed to have been served at the expiration of forty-eight hours after it is posted, and in providing such service it shall be sufficient to provide that the envelope containing the communication was properly addressed and posted. These rules took effect on 1st April 2011.